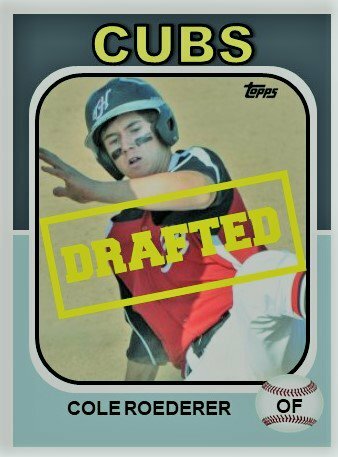 The Cubs basically had three second round picks after taking Stanford SS Nico Hoerner in the first round. And all three are high-risk, high-reward types. You could say there selections in that round were a bit of a mystery, but all three were slated to go in the first three to five rounds in the draft. And all three have high upsides. Davis will be a project for any team that tries to sign him away from his Miami commitment. But teams that love raw tools may look off into the future and see an Adam Jones or Lewis Brinson type if it all comes together. After the draft, several sources, including Fangraphs Eric Logenhagen, leaked that Davis was asking for 1.5 million to forgo his University of Miami commitment. That explains why Davis was taken in that spot. As I said earlier this afternoon, sometimes it is about money. Davis should begin his career in Mesa. What is going to help him the most is that he is athletic and he has plenty of room to put on some muscle. While Cole Roederer’s name sent me scrambling to the Google machine, I really liked the upside in everything I read for the UCLA commit. He has been compared to Andrew Benintendi of the Red Sox. Roederer is 6′ and 175 lb. outfielder with definite speed and some serious burgeoning pop. 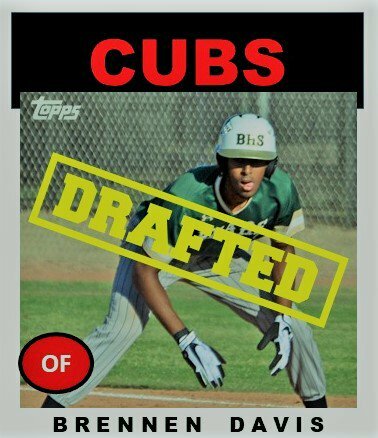 Of the Cubs’ four picks tonight, he might be the one I am most excited about. He throws and hits left-handed but injured his right shoulder and missed the last month. Like Davis, Roederer is going to be an expensive sign, but he does have that high upside, probably even more so than Davis. Ranked at 161 by Baseball America, his injury knocked him off MLB Pipeline’s top 200. Once again, he’s another high-risk, high reward guy. He should begin his career, when his shoulder heals, down in Mesa in the Arizona Rookie League. I am excited to see what he can do at the plate, on the basepaths, and in the field. He’s possibly on his way to being a five tool guy if he can improve his throwing. As for Paul Richan, he fits the mold of what I call a Utility Pitcher. He can start, he can relieve. Richan, a 6’3 200 lb. 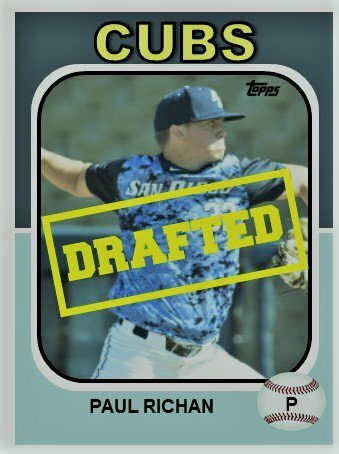 right-hander from the University of San Diego has done both the last three years. He was strictly a reliever as freshman, pitched 7 games in relief as a sophomore while starting 11. This year, he strictly started in 13. He got off to a good start before fading down the stretch but managed to strike out 10.14/9 innings. I am not sure why the Cubs took RIchan here unless they liked his versatility. He will likely pitch some at Eugene in either 2-3 inning starts or in relief. We won’t get a better idea of his pitchability until 2019. He does have a fastball that sits anywhere from 91-94 when strong and 88-91 later as he wears down. He does have a passable changeup and a slider, which is considered his out pitch. Right now, I am a little perplexed about why these three were taken in these slots. I would like to hear Jason McLeod has to say to my query. The answer, as usual, probably will be money. There are still 38 picks left to go and some big names left. I will be back at this tomorrow at noon central live blogging the picks and making some cards. ‹ PreviousLet the Round Two of the Live Blog Begin…It will be over quick!